It appears that the harmonica is enjoying the bloom of several young players, after decades of being ruled by the likes of Toots Thielemans, Larry Adler and Howard Levy. Foremost among the new generation of players are the Great German, Hendrik Meurkens, the Swiss-American, Gregoire Maret, the formidable South African Adam Glasser, the Spaniard, Antonio Serrano and now a Frenchman, Yvonnick Prené. Make no mistake the fact that there is such a rich crop of new virtuosos is something of a musical phenomenon as the harmonica is one of the most challenging instruments. Its tiny reeds and small number of chambers makes the instrument relatively restrictive. 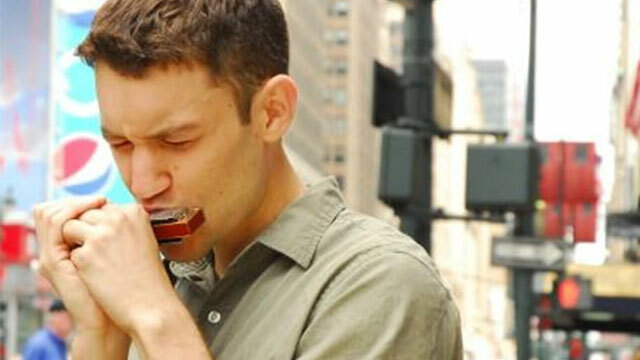 Moreover, unlike other horn instruments the breath is expelled into the mouthpiece to produce a note or series of notes, but with the harmonica, playing notes involves both intake of air as well as expelling the air. So without supreme breath-control it would be next to impossible to play the instrument, let alone become a virtuoso player. 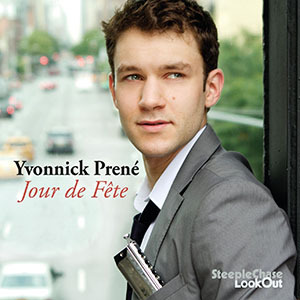 Yvonnick Prené seems to come from the school of chromatic players that Toots Thielemans was born into. Mr. Prené is a sublimely talented player. There is ample evidence of this on Jour de Fête. His musical leaps and gambols are absolutely magnificent giving rises to beautifully crafted musical architecture. Mr. Prené plays with exquisite confidence knowing exactly where he must go when pursuing a melody. He is also a most expressive player and can wring emotion out of rapidly played chromatic runs as well as when he seems to dally on a note to produce an elemental ache—as he does several times on the superb rendition of the classic “Never Let Me Go” as well as on “As Night Falls,” where he shares the limelight with pianist Javi Santiago and the magnificent bassist, Or Bareket. Mr. Prené is also a fine interpreter of music and plays Dizzy Gillespie’s “Con Alma” with passion, grace and fire, even though he ups the tempo from versions played by Stan Getz and Michel Camilo. Here Mr. Prené plays the melody with a deceptively straight reading at first, before taking off into the infinite soul of the song where his creative improvisations seem to know no bounds. There is something else about this record that is unique and it has to do with the maturity of Yvonnick Prené. This is his ability to exercise supreme control over his instrument. For a player so young, he eschews the temptation to let his virtuosity get the better of him and seems to have a brain that tells him exactly which note to play. There is none of that fuss of playing a slew of notes in order to express himself. In fact Mr. Prené can express his music with sound as well as silence. He is also able to share centre stage with the other musicians in his ensemble without losing sight of the fact that the harmonica is the first voice. Thus the two guitarists, Michael Valeanu and Isaac Darche are able to shine with remarkably harmonic and rhythmic grace. The pianist Javi Santiago is also a musician to watch as he is not only a great accompanist with beautiful listening skills, but also a fine soloist as he proves this time and time again. The fact that Mr. Prené gives them all space to express themselves is a testament to his maturity. Mr. Prené is also a fine composer. His music is mysterious in the rhythmic twists and turns that pursue the often magical melodies that they are comprised of. His sense of harmony is also quite accomplished and this is revealed in the light and dark colours that are made to mingle into the music. Some of his work is also adventurous as the chart “A Billion Stars” shows. The inclusion of recitation by the legendary science fiction writer Ray Bradbury in the piece sets the tone for an exciting composition. All this is evidence of an exciting musician of whom much is expected in the near and far future. Tracks: Obsessions; Thais; Never Let Me Go; Satellite; As Night Falls; Con Alma; Home; A Billion Stars; Nobody Else But Me; Escales; Jour de Fête. Personnel: Yvonnick Prené: chromatic harmonica; Michael Valeanu: guitar (2, 7, 10, 11); Isaac Darche: guitar (1, 4, 5, 6); Javi Santiago: piano; Or Bareket: bass (1, 2, 4, 5, 7, 8, 10, 11); Phil Donkin: bass (3, 6, 9); Jesse Simpson: drums (1 – 7, 9 – 11); Owen Erickson: drums (8); Ray Bradbury: recitation (8).